Jay Gifford, Athletic Director at Dodge City High School, Kansas talks about their fundraising success for the last decade using digital scoring tables. Jay walks through their fundraising process. 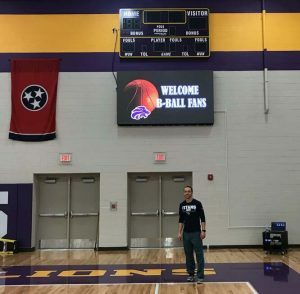 Dave Hancock, Athletic Director at South Eugene High School, Oregon talks about getting 34 sponsors in their first year of using Sideline Interactive’s basketball scorer’s table. Sideline Interactive’s scoring tables have exclusive features that makes operating the scoring table easy and useful for every day practices. – Unlimited digital advertising program for basketball, volleyball, and wrestling. Put as many ads, commercials, player highlights and game film as you want on the digital scorer’s table. One button instant animations for 3 POINTS, FREE THROW, TIME-OUT or PLAYER PICTURES on the scorer’s table whenever you want then resume advertising where it left off. – VIDEO REPLAY – HUDL, KROSSOVER, SYNERGY, DV SPORTS compatible, watch replays and game film on the digital scorer’s table. No more having to go back to a classroom or rolling out a tv to the gym. – ADVERTISING and PROOF OF PLAY REPORTS- report which ads played, when, and how often with attendance figures. Show the business value of supporting your team. – Includes computer with all digital scorer’s table purchase. Computer comes with Sideline Interactive’s GamePresenter software which allows you to control advertising and watch game film, and more coaching tools! – ALL METAL TABLE CONSTRUCTION FOR YEARS OF PERFORMANCE. Will not crack or break under pressure like wooden tables. 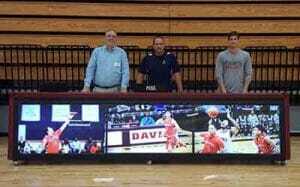 For the biggest and most exciting displays, see Sideline Interactive’s digital scoring tables and LED basketball scorer’s tables.